Writing this, I was sitting on the Mount of Beatitudes overlooking the Sea of Galilee. Below me, closer to the water, on my left and right are spots that mark many significant points in Jesus’ ministry. 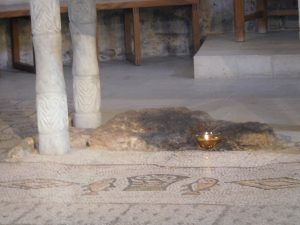 The ancient village of Capernaum, a chapel marking the Primacy of Peter, and a chapel with the famous mosaic of two fishes and five loaves from the year 480- marking the spot where Jesus multiplied these meager foods and fed the crowds. In Capernaum there is a house that then became the site of a church in 5th century. The house is thought to be that of the mother-in-law of Peter where Jesus would stay and where the mother was healed. It was also the site of one of the earliest house churches. Maybe 50 yards away there is the remains of a synagogue for the Byzantine period. 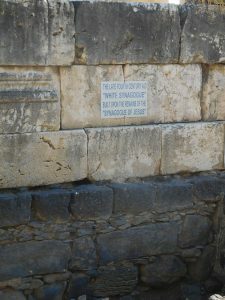 This synagogue is built with stone imported from Jerusalem but built on an earlier foundation of local basalt stone—Some archaeologists assert that this earlier synagogue is from the time of Jesus. To my left (to the north) 20 miles is Syria whose civil war and refugee crisis require no introduction. Back south is the West Bank of the Palestinian territories. Most of the week to this point has been hearing from an assortment of political, religious, NGO, and peacebuilding workers struggling in a situation of conflict that feels rather intractable. The significance of the land both present and past is of incomparable magnitude. Narrowly, this and the following verses are about wealth. I think, however, that money stands in for the assumption that we are in control or our desire to be in control. Though God (and the world with its histories and cultures) are big, you are misty—mist-like, ephemeral. This assertion is not negative, not an insult, it is simply honest. Though those of us who are at least relatively well-off may forget this, our lives are indeed contingent. Our lives are dependent. They are based in God. James addresses the one who confidently says they will do this or that. The hearers of the letter of James were likely not the well off—or the overly wealthy. So, it may not be that this or the next portion are as directly applicable to the immediate crowd. The general assertion, however, is very applicable, hence its inclusion. To those who are well confident that their plans will succeed, James asserts—you are mist—misty—mist-like in the fleeting quality of your life. Because you cannot know what will happen you should always acknowledge that even the best laid plans rest in God. The habit and practice that James exhorts is to, in all things, acknowledge that one’s life is held in God. Your existence is in God. As I’ve been reading James I have also been thinking about a similar passage in the Sermon on the Mount. Given my writing location if felt particularly relevant to note this. In the sixth chapter of Matthew, Jesus teaches: Why worry about your life?—about what you will eat or drink or wear. Are not the flowers of the field more splendid than Solomon, the most extravagantly dressed of all kings? 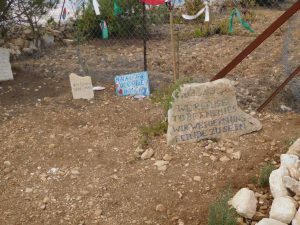 The sign by the entrance says, “We refuse to be enemies.” The Tent of Nations (http://www.tentofnations.org/ ) is a Palestinian farm on a hill top in area C. Area C is part of the West Bank, the land of the future Palestinian State. It is also the site of many settlements, which are illegal under international law, undermining the possibility of a future state, and more like towns or cities than anything makeshift that is indicated by the term “settlement.” To get to the Tent of Nations we left our van and climbed over boulders that have been placed on their road a few hundred meters from their farm in order to impede access. The farm is on a hill top. Every other hill top surrounding has a massive settlement. We met with Daoud Nasser whose family has lived there for generations. 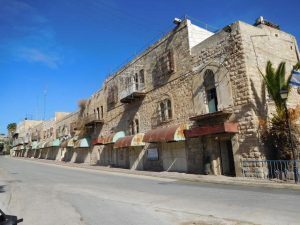 Unlike most Palestinians whose land is at risk they have a clear line of documentation of land ownership going back to the Ottoman Period in the early 1900s. Since the land is documented but still deemed very desirable, they have been fighting in courts since the early 1990s. The case keeps getting passed back and forth between the Supreme Court and Military courts. They must keep fighting and filing because if they don’t they will be forced out. They can’t build any new structures and the structures they have—even the tent like structures—have demolition orders on them. Daoud Nasser, though, seems to be full of joy. He told of their struggle just to keep their family’s land. He demonstrates a trust in God and in others to continue on. Unsurprisingly, the rich also have this problem. They also easily forget that their existence is in God. James doesn’t discuss if there are righteous ways to be rich. Certainly, our congregation isn’t rich compared to much of Capitol Hill. Because of this and certain prophetic inclinations we may find it easy to speak critically—to speak “prophetically.” However, though we are not that rich we are comparatively rich in relation to much of the world. And as such may be indicted. The rich people that James addresses have built their riches on the backs of others. For white America the legacy of slavery of Africans and genocide of Indigenous communities is a clear example. But also, immigration, trade, and foreign policy often continue this pattern. Even as I recount these few notes from an hour long meeting I think back and begin to feel overwhelmed. And this was only one meeting out of the whole week. It is easy to feel the mist-like character of my life when held up against the enormity of the world. The enormity of the ancient stones and places of Jesus. The enormity of Syria just down the road. The enormity of the so-called Israeli and Palestinian conflict. I’m not sure that this is what James intends, but getting to the point of realizing our mistiness—our mist-like nature—is half the struggle. The second half is recognizing that our existence is in God. We are mist but our existence is sustained by the God who has mysteriously created us and called us. Our existence is in the God that has created and called us beyond ourselves. 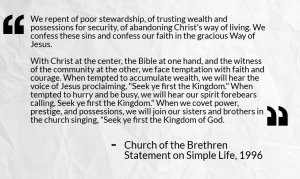 The commitment of the Church of the Brethren to living simply is evidenced in our slogan- “Peacefully. Simply. Together.” It is often easy to visualize the “peaceful” and “together” aspects of Christian life, but “simply” is discussed less frequently. To address this Brethren value more fully, Brethren Woods hosted “Simplify: A Simple Living Weekend,” in November. The conference brought together Christians interested in discussion about what this commitment to simplicity looks like in a world that values consumption, status, and material possessions. Over the course of the weekend, the keynote speakers and panelists shared their personal experiences with living simply. Sam Funkhouser, a member of the Old German Baptist Brethren Church, New Conference, made the case for a radical change to a non-conformist lifestyle, in which we live out the theological calls for simple living. If we do it correctly, he argued, a desire to live simply would be seen as the “natural end to a life of repentance.” In workshops, he shared practical advice for increasing a car’s fuel efficiency and making ethical, sustainable, and simple clothes at home. Jenn Hosler, co-pastor at Washington City Church of the Brethren, presented on the theological basis for a simple lifestyle. Citing Biblical passages calling for creation care, fair social practices and good stewardship, she drew connecting lines between Biblical teachings and the call for simplicity. Other workshop leaders included Nancy Heisey, who shared about simple living as it relates to technology, and Yakubu and Diana Bakfwash, who presented on what servant leadership looks like in today’s world. While each speaker had a different approach to simple living, they all believed strongly that Christians are called by their faith to live out a commitment to simplicity. In our culture, which values status and material possessions, it is not uncommon to feel as though we must hoard earthly wealth for security, respect and well-being. The Bible challenges this notion. The Parable of the Rich Fool was brought up many times in small group conversations. In this parable, a rich man tears down his existing barns and builds bigger ones, in order to store the excesses of his harvest. In doing this, he hoards his own excessive wealth at the expense of the hungry in his community. Jesus reminds his audience in this chapter to “Be on your guard against all kinds of greed; life does not consist in an abundance of possessions.” (Luke 12:15). A Gandhi quote that has become popular in our churches in recent years is, “Live simply so that others may simply live.” This call reflects the disparate living standards around the world, and the unsustainable nature of our own consumer culture. The earth does not have enough resources to support a humanity in which every person lives the type of lifestyle that most Americans enjoy. The theological call to live simply is one that must be lived out in daily live, as a constant public witness. The way in which we live tells others a lot about our faith and worldview. 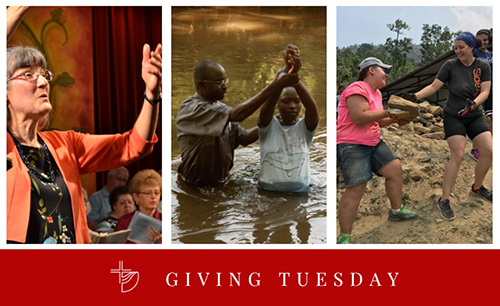 One of the ways in which the Office of Public Witness works to encourage this simplicity in the ecumenical community is by supporting Creation Justice Ministries (CJM). Efforts to reduce the impact we have on the environment, and to reduce our excessive consumption, are key to working towards a simpler lifestyle. The 1980 Annual Conference Statement on “Christian Lifestyle” says that “we cannot sit easily in the seats of wealth and power of an oppressive status quo.” As members of a society that uses more than our fair share of resources, our consumption directly impacts poor and marginalized people around the world. We push the cost of our cheap consumer goods off onto the underpaid factory workers that produce them, the children who breathe polluted air, and the communities burdened by the landfills and incinerators built to dispose of our trash. We must be intentional about confronting ourselves about the ways in which we are not faithful stewards, and work to reflect our commitment to simple living with real lifestyle changes. Dr. Rebecca Dali is the founder and executive director of the Non-profit called Center for Caring Empowerment and Peace Initiative (CCEPI). For several years the Church of the Brethren has been providing funds for CCEPI’s work. The last two years we have sponsored three Livelihood Centers in Jos, Yola, and Michika. The students are either widows or orphans (Muslims and Christians) who have no way to support themselves. 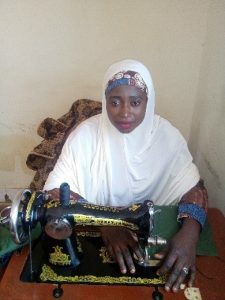 The attend classes for nine months at the Centers and are trained in computer, sewing, or knitting and taught skills for running a successful business. 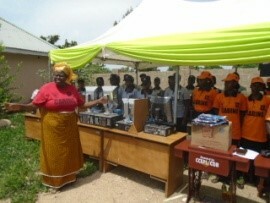 At the graduation, the students are given a computer, sewing or knitting machine and sent out to start their own businesses. This fall 119 students graduated in joyful ceremonies that included dancing, singing and some tears. In addition to the specific training, all the students learn how to make shampoo, lotion and dish soap that they can use or sell. 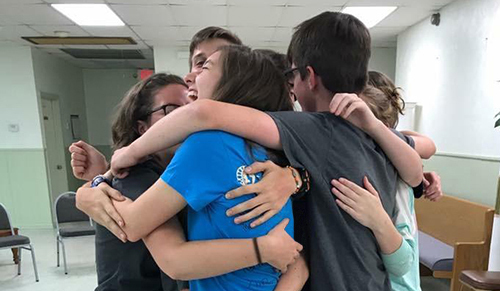 The students have all been traumatized in one way or another so they form close bonds and are an informal support group. During the nine months at the Livelihood training center, they also have a chance to tell their stories and these are written down. HAJARA – On the 06-08-2012 my husband, Abubakar, of the Nigerian Army Rukuba Cantonment was drafted to Military for peace keeping. He spent almost four years in this exercise. From time to time he would collect a pass which enabled him come and see me and the children. 0n 10-7-2016 in the morning some soldiers came to my block and told me that on 10-6-2016 boko-haram attacked the Military unit in Sambisa Forest and killed Officers/Men and that my husband was among those killed. I just burst into tears and fainted. His death has left me with five children to look after. His death benefit is yet to be worked out so life has not been easy for me and the children. I am very thankful to have been selected to attend the CCEPI Skills Acquisition Center. 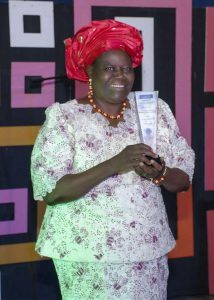 ESTHER – I lived in Gava II with by mother and siblings. On the 5/9/2014 by 9:00am, I was down with fever but I still had to fetch the water and check to see if my corn was ground. On the way from the well to the mill, I heard people shouting “ku gudu, ku gudu” in Hausa, meaning “lets run let’s run”. I started running but due to my ill-health, I could not run fast enough and when I was about to climb up the mountain, the boko haram caught me and brought me to Pulka along with five other women. After five days under the care of one man called Aliyu, he took us to Gwoza. Here we joined Chibok girls by name Saratu Yahi and Saratu Tabbji who were kidnapped along with their mates in G.S.S Chibok. While in Gwoza, a man named Bana bought me as a slave/wife from Aliyu. I was taken to another village; while there, I got pregnant by the man, Bana. My owner/husband, Bana, along with other boko haram members went for attack on innocent people. Unfortunately, he was killed by the soldiers. It was then that I began to plan my escape. With the help of God, I was able to follow one small road and then joined a vehicle traveling to Maiduguri. When the soldiers started asking questions during checks on the road, I told them that I had escaped from a boko haram camp. They immediately took me to their barracks in Maiduguri where they interrogated me on how I survived in the Sambisa. They asked me to call my parents to take me home. Before I was kidnapped I was married to Ubale. 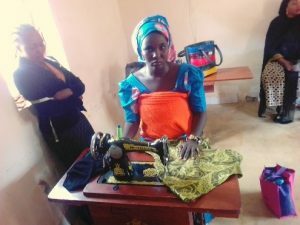 When I came out of the Sambisa forest heavily pregnant by boko haram, I came to my husband but he drove me away and said that he was no longer interested in our marriage. When the Director of CCEPI, Dr. Rebecca S. Dali, heard of my case, she gave me a room, food, cooking utensils, mattress, and blanket. Then she enrolled me into her center where I am learning how to sew. I am very grateful to God and Dr. Rebeca S. Dali. Participants at the North Fort Myers (Fla.) workcamp this past summer. “You have heard that it was said, ‘Love your neighbor and hate your enemy.’ But I tell you, love your enemies and pray for those who persecute you, that you may be children of your Father in heaven” (Matthew 5:43-45). The words of Jesus have always been radical. He carefully, yet firmly, addressed the concerns of the day and called his peers and adversaries into the transformative, often uncomfortable ways of God. For the Jews who had been scorned and oppressed by other nations for generations, the call to love enemies was not an easy one. It meant laying aside pain and pride, and offering care to those who had brought them harm. It meant working for the good of others whether or not the gesture was returned. In a world where actions typically provoke similar reactions, this enemy-loving way of living can seem both ridiculous and risky. It’s natural to be stirred with anger when someone inconveniences you. It’s easy to justify retaliation when someone spreads destructive lies about you or threatens the wellbeing of your loved ones. And yet, it is the script-flipping maneuver of repaying aggression and harm with compassion that makes room for the work of the Holy Spirit. When we choose to offer grace instead of revenge, we allow God to work in us and we invite others—yes, even those who oppose us— to grow more fully into their identities as children of God. We see this unrelenting love in the work of our partners in the Democratic Republic of Congo, Nigeria, South Sudan, and other places. Our sisters and brothers offer help to all who are in need. They reach across cultural divisions and allow programs for trauma healing and peacebuilding to bring restoration for people of an entire community, not simply their own. In our congregations, we love our opponents (perceived or real) as we reach out into our communities. Through offering recreational or educational opportunities, we create meeting places where people of all walks of life can find common ground and build relationships. By creating safe spaces of hospitality, we invite people of different faiths, beliefs, and opinions to express their concerns and their hopes, and allow everyone to contribute for the well-being of all. The ministries of the Church of the Brethren embody what it means to love all people, including enemies and opponents, and to work for reconciliation—with others and with God. Will you support this transformative work and join us in sharing the radical love of Jesus? Learn more about the work of the Church of the Brethren at www.brethren.org or support it today at www.brethren.org/give.